Balance: How to find balance in your life and enjoy life more. Balance is our theme today…. “The best and safest thing is to keep a balance in your life, acknowledge the great powers around us and in us. If you can do that, and live that way, you are really a wise man.” – Euripides. Maintaining balance in life is what many (perhaps most?) people strive for, yet many complain that it’s a difficult, if not impossible endeavour. Granted, life gets in the way. That’s pretty much a universal complaint I see and hear made by clients, students and peers. There are kids to tend to, errands to run, the job to perform well at, learning new skills, attaining a certain level of education and/or experience, relationships to manage, bills to pay, health to take care of – and so much more. Is it any wonder that there sometimes seem to be too few hours in the day and oh, so much left to do? This has to be important, no shoving it to the bottom as irrelevant, nice to have, but not necessary. 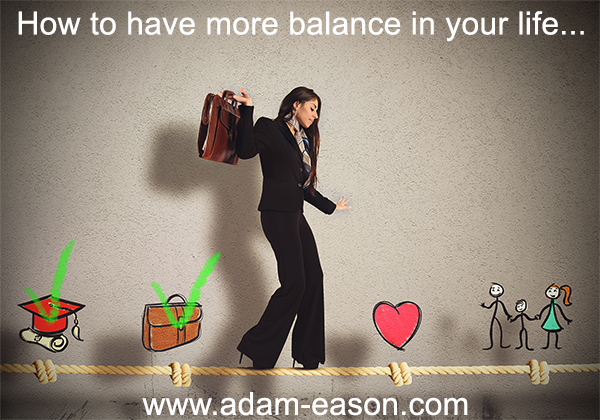 Balance is extremely important in living a fulfilling, happy and meaningful life. The 2017 World Happiness Report reported that work-life balance is now one of the strongest predictors of happiness. Unfortunately, only one third of British are satisfied with their work-life balance. There are undoubtedly many items on your daily to-do list that really don’t need attention from you right now. Some can be eliminated altogether – so do that right away. Take care to not ditch those that you detest, just to be rid of them. If they are important, strategic and/or necessary, you will need to figure out how to deal with them appropriately. This may mean taking time to craft a strategy, enlisting help, delegating to others, creating a workable timetable and more. The point is to reduce the drags on your time, to free some time for a personal life or for things that bring you more joy or success – and starting the worthwhile path toward achieving and keeping balance in your life. This is so important and something I write and talk about often. With so many works, home, school or other priorities seeking to claim your time, in order to have any hope of achieving a balance in your life you need to schedule time for you. This is time to do whatever you want that delights, relaxes, stimulates, intrigues or helps you socialise. It doesn’t have to be a large block of time all at once. Even a half hour strategically placed will do wonders for your balancing goal. Keep in mind that a well-rested, unstressed person is much less likely to be frazzled when the unexpected occurs. By factoring in time for yourself, you’re helping to achieve that balance that’s so necessary for healthy living. You want to be liked by others. That’s human nature. Where many people get into trouble is that they can’t seem to say no when they’re asked to take on tasks and projects when they’re already overwhelmed by what they have to do. It isn’t mean or selfish to say no – just learn how to say it graciously. Soften your words with a promise to lend a hand when you’re able to do so. Then follow up and offer your assistance at a time that’s right. I said it once already, I’ll say it again…..
One of the biggest areas where people to get out of balance is in going after goals. The tendency is to try to attack too many all at once. The corollary is that the number, complexity, and difficulty of so many goals is overwhelming. This can result in a shutting down and giving up. In either case, there’s a definite lack of balance. One approach to get past this dilemma is to prioritize goals. Categorize them into short-, medium- and long-range goals. Create a workable timetable for addressing them. Enlist resources. Craft a plan of action. These steps will help to introduce more balance into your life. Thinking time is very important, however, in the fast-paced world in which you may find yourself living, sometimes you may not feel that you have time to do this. Do bear in mind that by factoring in this time it will provide you with an opportunity to slow down, take stock and amend your plans and behaviours. This can help you to become more efficient in the long term and work out where best to put your time and energy. Reflect upon your feelings, thoughts and behaviours within the varying situations and scenarios of your life. Setting yourself personal limits is a useful thing to do and can be applied to anything that you tend to do too much of. If you work ten to twelve hour days, for example, set a limit of eight hours per day, and stick to it. Learning to work smarter and managing your time better will help you to be realistic about what you can achieve in the timescale you have available. Accept that you are not superhuman and have a limit to your capacity to do things. Prioritise what is, in fact, necessary and important to you. Be “ruthless” about what you keep, and let go of what you don’t need. You can then focus on what truly matters and not spend time worrying or being stressed by things that really don’t matter. Eliminate what you don’t need to keep, but not everything has to go into the bin or even recycling bins. Donate to a charity or sell the items and allow yourself the freedom from feeling guilty or wasteful. If you aren’t using it, chances are someone else can find a use for anything that you no longer need. Why You Need A Digital Detox and How To Have One. You will be amazed at how different your life is when you are not surrounded by clutter and overwhelmed by things. It is like facing a boulder in the road, that you have no idea of how to climb it, but if you break it down into small pebbles, it soon becomes much easier to navigate and negotiate. Likewise, if you’d like to learn more about self-hypnosis, understand the evidence based principles of it from a scientific perspective and learn how to apply it to many areas of your life while having fun and in a safe environment and have the opportunity to test everything you learn, then come and join me for my one day seminar which does all that and more, have a read here: The Science of Self-Hypnosis Seminar. Alternatively, go grab a copy of my Science of self-hypnosis book, it’ll help you find balance!